so that afternoons have more daylight and mornings have less. 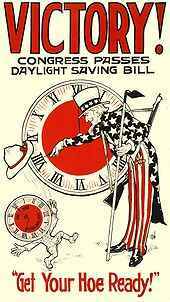 Typically clocks are adjusted forward one hour near the start of spring and are adjusted backward in autumn. Modern DST was first proposed in 1895 by George Vernon Hudson, a New Zealand entomologist. Many countries have used it since then; details vary by location and change occasionally. The practice is controversial. Adding daylight to afternoons benefits retailing, sports, and other activities that exploit sunlight after working hours, but causes problems for farming, evening entertainment and other occupations tied to the sun. Traffic fatalities are reduced when there is extra afternoon daylight; its effect on health and crime is less clear. Although an early goal of DST was to reduce evening usage of incandescent lighting, formerly a primary use of electricity, modern heating and cooling usage patterns differ greatly, and research about how DST currently affects energy use is limited and often contradictory. DST’s occasional clock shifts present other challenges. They complicate timekeeping, and can disrupt meetings, travel, billing, recordkeeping, medical devices, heavy equipment, and sleep patterns. Software can often adjust computer clocks automatically, but this can be limited and error-prone, particularly when DST rules change. Willett’s 1907 proposal argued that DST increases opportunities for outdoor leisure activities during afternoon sunlight hours. The longer days nearer the summer solstice in high latitudes offer more room to shift daylight from morning to evening so that early morning daylight is not wasted. DST is commonly not observed during most of winter, because its mornings are darker: workers may have no sunlit leisure time, and children may need to leave for school in the dark. General agreement about the day’s layout confers so many advantages that a standard DST schedule usually outranks ad hoc efforts to get up earlier, even for people who personally dislike the DST schedule. The advantages of coordination are so great that many people ignore whether DST is in effect by altering their nominal work schedules to coordinate with television broadcasts or daylight. Get Wise info provided by Wikipedia, the free encyclopdia.